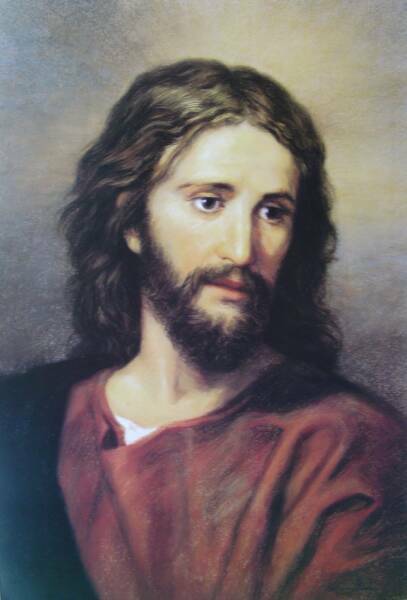 This beautiful image of Jesus was painted in pastel by Maryland artist M. Patricia Ginter in 2003. Several years ago while going through a difficult time her husband gave her a small prayer card with the face of Jesus on it. She found much consolation in his gentle and compassionate gaze. "The expression of Jesus in Heinrich Hofmann's painting Christ and the Rich Young Ruler gave me the inspiration for this pastel painting. "It is my hope that this image of our compassionate Lord will touch the hearts and spirits of all who see it, bringing comfort, joy, healing and strength, and will help to recall for them God's merciful and everlasting love." Prints are available from the artist.